Like many archaeological sites there has been some discussion about the authenticity of the Piprahwa Stupa and its' contents. The main reason to doubt the Piprahwa find according to critics is due to the presence of Dr Führer, an archaeologist and curator at the Lucknow Museum in Northern India at the time of the Piprahwa excavation, and who was later found to have forged and plagiarised some of his research. Some critics have therefore suggested that Dr Führer may have been involved in forging the Piprahwa find, and have subsequently created what may appear, on the surface, to be a convincing narrative of deceit and fraud. "...scrupulous researcher who respects his sources. In these pages he pieces the story [of the Piprahwa find] together like the shards of a broken vase while avoiding the Führer tendency to reach hasty conclusions...Allen has achieved his goal with admirable rigour." All the documented evidence Allen uncovers in his analysis of the Piprahwa find shows that Dr Führer had absolutely no relationship with my grandfather prior to the excavation. And even after the discovery at the Piprahwa Stupa, documented letters from that period show Dr Führer's unwillingness to leave his archaeological excavations fifteen miles at Sagarwa to visit Piprawha and see what had been unearthed. Which begs the question, why would Dr Führer be involved in a fraud to unearth the relics of the Buddha, and then fail to turn up and be involved in their discovery? Especially since the effort involved to carry out this fraud, if Dr Führer was acting alone, would have been huge. For Dr Führer to carry out this fraud alone he would have had to travel fifteen miles from his camp at Sagarwa across rough ground and jungle (by horse and elephant, taking many hours), clear the dense scrub and jungle that covered the Piprahwa Stupa, remove a thick layer of ancient bricks that covered the stupa, and then “plant” the urns to a depth of (10ft) and (24ft), with those at 24ft in a coffer with covered with an extremely heavy stone lid, and then replace all the soil and bricks. That would be quite a remarkable achievement and also without anyone noticing! And he would then have to hope that by some remarkable coincidence my grandfather would excavate the same stupa! However, some critics argue that Dr Führer was not working alone but had teamed up with my grandfather and Vincent Smith. But this conspirational narrative falls down in many places. Firstly, as already stated, there is no documented evidence of a relationship of any kind prior to the excavation of the Piprahwa Stupa between my grandfather and Dr Führer. Any correspondence evidenced from the letters of the time clearly relates to a professional relationship after the find, since my grandfather, by law, had to notify Dr Führer of his discovery. Secondly, my grandfather had absolutely no motive to be involved in such a momentous historical fraud. He was a wealthy and successful man, and more than happy to give the relics away without any recompense to the Indian authorities. Indeed, it was others who rewarded him with a small share of the two thousand relic pieces, a silver-gilt salver and some stamp albums; hardly recompense for the effort and expense in excavating the mound and the labour involved. Thirdly, some critics have pointed to a few errors my grandfather made in copying the famous inscription on to paper. They suggest that two of the symbols he copied ignored other marks that someone unfamiliar with such a language would have copied. This, they suggest, means my grandfather was more knowledgeable then he let on. 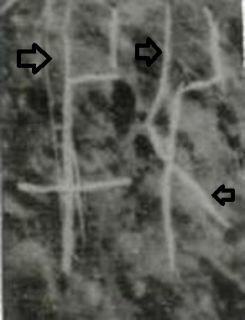 However, like with other conspiracy theories, the explanation is much more mundane and to do with angles, light and depth of the markings. From some angles and in some lights (remember my grandfather was probably copying the inscription at night using candles), the marks that are missing off my grandfather's copy could easily be missed out. Please see the photographs below. The "ki" and "ti" in this light and angle does not show the marks (detail below) critics say my grandfather should have noticed. Fourthly, it was Vincent Smith who was instrumental in Dr Führer's downfall and the unravelling of the Dr's fraudulent research. If Dr Führer had been involved in a conspiracy with my grandfather and Vincent Smith to fake the Piprahwa find, why did he not point the finger at them too when he had been found out? But that never happened, and Dr Führer resigned quietly without protest or incriminating anyone else. Fifth, some critics have pointed to the ashes and bones as sources of evidence to suggest that the Piprahwa find is not genuine. One critic suggests that a famous scholar at the time of the finds - Dr Theodor Bloch - scoffed at the idea that the bone fragments found at Piprahwa were human; and that my grandfather's statement that some of the bones did not look that old shows that the bones were planted. In answer to the first question, the notion that Dr Theodor Bloch, even as an expert, could easily tell cremated human bones from animal bones just by looking at them is not true. According to scientists at the <?xml:namespace prefix = "st1" ns = "urn:schemas-microsoft-com:office:smarttags" />Arizona State Museum it is not always easy to tell the difference between animal and human bones, especially if the bones are fragmented or have been subject to heat . Also, some bones can still be easily identifiable from ancient cremations according to some archaeologists. Theodor Bloch's statement therefore holds little weight if we don't actually know what he was shown (bone fragments or easily identifiable parts), and how long he studied them for. However, despite Dr Bloch's alleged doubt about the ashes interred at Piprahwa, he shows little doubt about the value of the Piprahwa find and its' inscription when writing in the archaeological collection of the Indian Museum just before his death. He also states very clearly that the majority of the find was housed in the Indian Museum in Calcutta at the time of writing. On the same issue of bone evidence, much has also been made by critics of a tooth found amongst the material my grandfather discovered at the Piprahwa Stupa, which subsequently turned out to be a pigs' tooth. My grandfather, nor I, nor anyone else ever made claims about the tooth as being human, and we happily subjected it to scientific analysis. And as it turned out it did belong to a pig; but this result does not negate all other documented and expert evidence of the excavation, and nor does it mean the Piprahwa relics are just those of a pig. What it does show is that a pigs' tooth was found amongst the find. And that's it. Nothing more. Rational explanations for the pigs' tooth being found amongst the relics include it being in the soil from a dead animal (remember this was an extensive excavation site), to it being a relic placed in the stupa to symbolise the pig in the Buddhist wheel of life. Lastly, is the question that the Piprahwa find was thought up by the British government with the aid of Dr Führer, Vincent Smith and my grandfather, to help smooth diplomatic relations between Siam and Great Britain at a time of colonial expansion and rivalry. Nobody would deny the historical relationship between Siam and Great Britain at the time of the Piprahwa find, and the relics and jewels may have been used as a diplomatic colonial bargaining chip, but the Prince-Priest from Siam only came to Birdpur to see the relics and jewels after the find had been announced and not before. Furthermore, there are no references within any of the letters between my grandfather, Vincent Smith and Dr Führer of any grand diplomatic plan concerning the relics, Siam and Great Britain, and no official British records exist to suggest that this was ever the case. Indeed, Dr Glenn Smith from Imperial College London - a human geographer and expert on narrative research - having carefully reviewed the criticisms of the Piprahwa excavation says that "they often contain a subtle anti-colonial stance that is not declared or reflected upon." He also goes to to say, "that the narrative of forgery lacks balance because it fails to acknowledge and debate credible alternative explanations, ignores contradictory evidence, often confuses correlation with causation, and makes unsubstantiated connections in an effort to maintain a consistent narrative and interpretation of events. Crucially these criticisms fail to address the complex logistics of creating such a forgery." The 2006 Conference on the Piprahwa Find; a consensus of expert opinion. In 2006, at Harewood House, Yorkshire, a conference was held to explore the authenticity of the Piprahwa Stupa and the inscription on the urn referring to the Buddha. 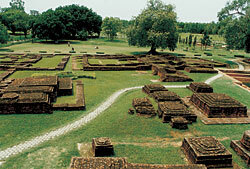 The conference was attended by several world leading academics in Indology, Sanskrit, and Asian languages, and included some critics of the Piprahwa find. The general consensus of several eminent scholars present (including Richard Gombrich, the Boden Professor of Sanskrit at Oxford, Oskar von Hinüber, Professor of Indology at Albert-Ludwigs-Universität, Freiburg), and Harry Falk, Professor of Indian Philology, was that the find at Piprahwa is indeed genuine. 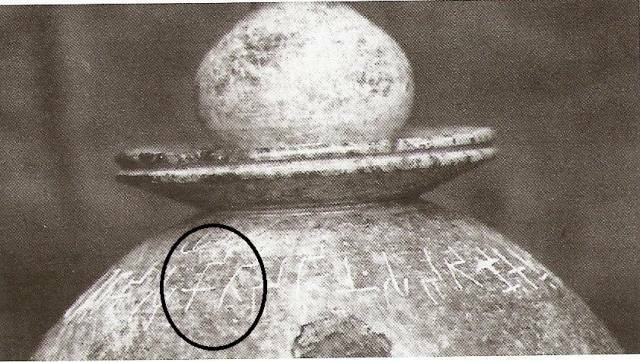 And according to Prof. Salomon (Professor of Asian languages of the University of Washington), the inscription on the urn referring to the Buddha's ashes is also genuine (Allen, 2008). Expert statements can be obtained on request. Since the 2006 conference, Charles Allen has presented a chronology of events of the Piprahwa excavation using documentrary evidence that clearly shows that Dr Führer had no involvement in the Pirawha find. In May of 2013 a documentary made by Icon Films and premiered on the National Geographic channel clearly, and in a balanced way, provided definitive evidence of the authenticity of the Piprahwa find, and in particular the genuineness of the inscription on the reliquary and it's interpretation. In this compelling documentary the world expert on ancient Indian languages - Professor Harry Falk - was, without a shadow of a doubt, completely convinced that the inscription on the urn could have never been made by Dr Führer, since he did not have the necessary knowledge to write such an inscription, but more importantly he would never have used or even known about one of the words inscribed on the reliquary. 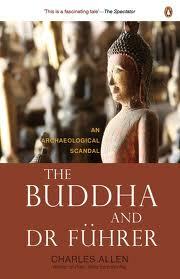 The film, like all the evidence outlined in this website and in Charles Allen's book, unequivocally points to the Piprahwa find to be that of the remains of Buddha that had been re-interred by the Indian Emperor, Ashoka, a hundred years or so after Buddha had died . The authenticity and language of the reliquary inscription, the materials used to the build the Stupa, and the workmanship of the stone coffer all point to this conclusion. I have offered ample balanced, rational, expert, and well documented evidence within this website and on this page as to the authenticity of the Piprahwa find. Several experts (not just one or two), vouch for the authenticity of the excavation and the inscription on the reliquary; and current documentary evidence provides further conclusive proof of authenticity. I have also demonstrated how impossible it would have been for Dr Führer to act alone and carry out a fraud on the scale of Piprahwa. And also shown that there is no documented evidence at all of my grandfather, Vincent Smith and Dr Führer working together on some grand forgery. My grandfather and Vincent Smith had no reason to be involved in such activity, while it was Vincent Smith who helped expose Dr Führer's misdeeds; Dr Führer never incriminated anyone else in his activities. Discrepancies over paper copies, and doubts over bone relics can be explained by science and using less conspirational explanations. Indeed, like most conspiracy theories, critics of the Piprahwa excavation unrealistically rest their case on all those involved never speaking out, or ever writing about their involvement in this supposed forgery. Given the large number of people that were involved in the excavation of the Piprahwa Stupa (including my grandfather and Vincent Smith, the many men who worked on excavating the site, and other members of the Peppé family who helped open the vases), it would seem highly unlikely that this grand deception could remain a secret for all these years. And even harder to believe that there is no official record hinting at diplomatic and archaeological skulduggery. Lastly, despite Dr Führer's known ability to forge relics, even he could never have written an inscription using a word he never knew existed. In the face of overwhelming evidence, it is now time that doubts over the Piprahwa find are finally laid to rest. And that history now accepts that the Piprahwa Stupa is one of the eight final resting places of Buddha.